While you're learning lots of ways to climb upward, also allow some time to learn the valuable technique oi downclimbing (fig. 9-38). 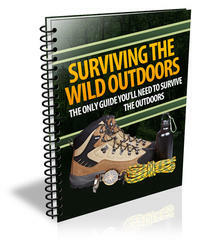 Down-climbing at times is faster, safer, or easier than rappelling, such as when rappel anchors aren't readily available. Downclimbing provides a way to retreat when you find yourself off route or on a pitch where the rock above is more difficult than you care to attempt. Downclimbing has its special difficulties, however, which helps explain why some climbers resist learning the skill. Holds are harder to see than when you're climbing upward—and holds on the steepest, most difficult sections are the most difficult to see, especially if the rock is undercut below a bulge or small roof. It's hard to test holds without committing to them, an unpleasant fact if you doubt the soundness of the rock. And unless you climbed up the same way, the terrain below is unknown, and you may not be able to anticipate the consequences of a fall. Fig. 9-37. Exiting onto a ledge: a, incorrect; b, correct. Fig. 9-38. 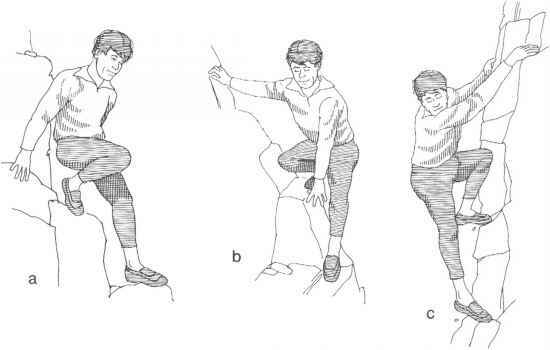 Downclimbing: a, facing out; b, facing sideways; c, facing in. As the rock steepens, turn sideways, leaning low, and lean away from the rock to look for holds away from the rock for better visibility. If the cliff below.